As my longtime readers and visitors will know, along with family and friends, I love to go all out for Halloween, and make it such a big thing, however, before Unique Young Mum existed, I wasn't big on Halloween at all, and rarely celebrated the event. However, when I started Unique Young Mum, I saw a diverse range of products by spending more time online, and threw a feature when I'd only been on the blogging scene for only two months! Now in the midst of my fourth feature, and having our own house we could decorate, all I needed to concentrate on was the front door area/porch, the hallway, living room, bathroom and kitchen, I found various things for each place, apart from the bathroom, there just wasn't much to choose from at all when it come to spooking the bathroom up! I did however come across a few things that did make the bathroom a success like the rest of the house, and have outlined them here for you below! Of course, some things need to be looked at all year round, like the bathroom lights, the decoration state, and the cleanliness of the dreaded bathroom tiles! I purchased a set of three stickers from Wilko for just £2! Included in the set was a toilet seat sticker, and two smaller stickers, one which I placed on the back of the toilet, and one above the sink where people washed their hands! Of course you could place all three stickers near each other if you'd like! The stickers are also reusable, as long as you keep the packaging in which they come on, I've used mine for the last two years now, and still have further use out of them! 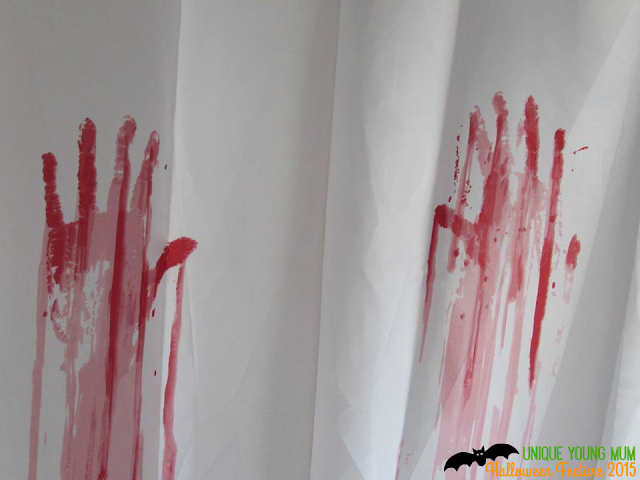 Due to my guest being mainly young children, I was a bit skeptical to put the shower curtain up, but I needn't have any worries as all the children loved it and all pretended it was there handprints! You can pick these up from gadget style stores, or on the internet! Draw the shower curtain and place a real life size skeleton in the bath and you'll be sure to give your guest a fright! 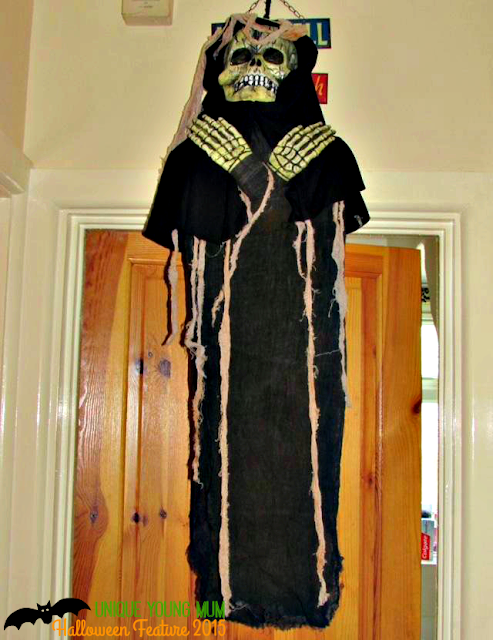 Of course this is optional, but wanting to go all out, I hung one of our freaky decorations infront of the bathroom door for that extra scare factor! Other things I've done in the past is buy cheap Halloween tape from budget stores, costing less than a pound which have warning signs on them like beware, keep out, caution and other similar sayings! 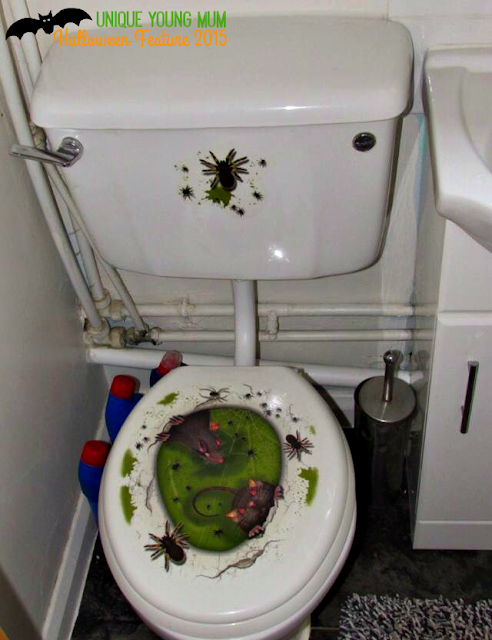 There are of course plenty of other items which you can use to maximise the scariness in your bathroom, but ones that I didn't find that child friendly, well at least not friendly enough to keep nightmares at bay! I'd love to hear any suggestions anyone else has! Please do drop me a comment below!